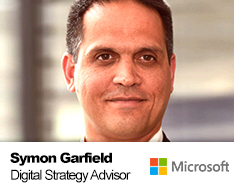 A digital strategy advisor with Microsoft Enterprise Services, and a doctoral researcher. I work with the leaders of financial services organisations to business leaders to re-imagine and bring to life the ways in which digital technologies can open new ways to transform customer interactions, create flexible, engaging and innovative workplaces, optimise operations, and create new business opportunities. My research focuses on the ways in which emerging technologies, particularly artificial intelligence, the Internet-of-Things, and Blockchain, will impact the future of work for individuals, organisations and society.